How do I cast my screen using Chromecast? 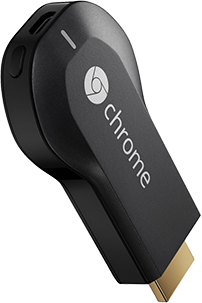 Chromecast is a media-streaming device that plugs into the HDMI port on your TV. Chromecast works with many apps to cast videos, music and other media to your TV. You can use the free Google Home app to cast your phone's screen; visit Play Store to install it. Set up the Google Home app on your phone. Set up your Chromecast in the Google Home app. Visit here for assistance. Set the input to your TV's HDMI port where Chromecast is connected. Make sure your Chromecast and Android device are on the same wi-fi network. 2. On your phone, open quick settings and touch Cast. 3. Touch the name of the Chromecast to use. When your screen is casting, you’ll see in the status bar. To stop casting, open quick settings, touch and touch . For more information, when you are not casting your screen, open the Google Home app and touch > Help. 2. In a Chromecast-compatible app (like YouTube), touch . 3. Swipe the status bar down to control the app or touch the notification to open the app. You can still make and receive calls and use your phone’s other features while casting an app. To stop casting your screen, on the app screen that is casting, touch > Disconnect.